Persona Q2: New Cinema Labyrinth is officially coming to the west. 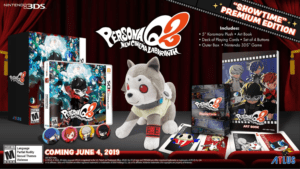 There were many questions as to if Persona Q2 would be seeing a western release after its initial launch in Japan back in 2018. Today, Atlus has indeed confirmed it will make its way here on June 4th. The game will be an exclusive to the Nintendo 3DS and will cost $39.99. The game is a sequel to 2014’s Persona Q: Shadows of the Labyrinth, and will feature the main casts of Perosna 3, 4, and 5. The game will be in full Japanese and have English subtitles. There are no plans for an English dub soon. TGS 2015 : Persona 5 gets anime announcement and new Videos!